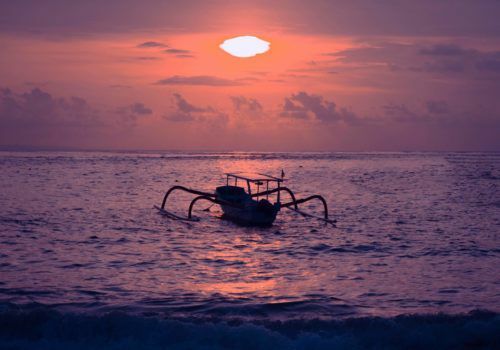 This itinerary will allow you to get under the skin of Bali, visiting rural areas and exploring its fascinating and diverse history. Visit the UNESCO heritage listed rice fields of Jatiluwih, explore the lakes and discover 11th-century temples. Augment your stay with additional nights at a beach resort for the ultimate combination of exploration and relaxation. Arrive this afternoon at into Bali where you will be greeted by your guide. A private transfer takes you to Candidasa in Karangasem, Bali’s eastern province where you’ll check in at your hotel in Candidasa where the remainder of today is at leisure. After breakfast you are picked up by your driver and tour guide to explore the less visited province of Karangasem. You start with a visit of Tirta Gangga. Meaning ‘water of the Ganges’ this sacred water palace was built in the early twentieth century by the last king of Karangasem. It boasts many decorative ponds and fountains, lush plant life and natural bathing pools. Stop for lunch at the famed Bali Asli restaurant for authentic Balinese food. Proceed to Tenganan and stop en route in the village of Sibetan to observe traditional weaving and visit a salak plantation where you can taste Bali’s famed ‘snakeskin’ fruit. Then, set off on a 2-hour trek through the rice fields down to Tenganan, one of several ancient villages in Bali. At the end of the trek, you’ll explore Tenganan. The village is home to the Bali Aga people, Bali’s first inhabitants, here before the arrival of the Majapahit dynasty people who came from Java. You’ll see the village’s unique architecture as well as observe the weaving of the ikat pattern and traditional basket weaving. Return to your hotel in Candidasa where the remainder of today is at leisure. Breakfast is served in the hotel and after check out the driver and tour guide will be waiting for you. First you go to visit Besakih, known as the ‘Mother Temple’ of Bali. Located on the western slopes of Mt Agung, Bali’s highest volcano (3,031m), Besakih is the largest and most important temple on the island. Continue the drive inland and upon arrival at Kintamani, stop for lunch at a local restaurant where you will enjoy spectacular views over Lake Batur and its volcano, Mt Batur. 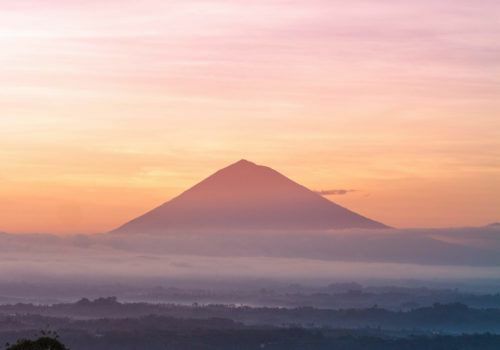 Although Mt Batur (1,717m) is not the highest volcano in Bali, it is the most active and is surrounded by an impressive caldera which overlooks the lake. After lunch drive over the mountains and make a stop at the Beji temple after which continue to Lovina where you check in to your next hotel in the late afternoon. Morning at leisure on the beach in Lovina to relax. This afternoon you’ll drive to Brahma Vihara Arama, a rare Buddhist temple in Bali for a visit and from here we go to the hot springs where you can take a bath in these sacred waters (changing facilities are basic). We drive further up the hills over scenic roads before descending to the beautiful remote area of Munduk in Northern Bali. Arrival in Munduk towards the end of today, check in to your hotel and after freshening up, enjoy dinner at hotel. Munduk is the ideal location for outdoor activities and this morning you’ll have the chance to explore with a light trek. Munduk is surrounded by tropical rainforest with beautiful waterfalls and because of its cool temperature (20-25°C) many fruits, vegetables and spices are grown in the area. This 2-hour trek begins this morning from your hotel. The trek takes you through many plantations growing coffee, cloves, vanilla, avocado and more- you’ll see how they are grown and harvested. Return to the hotel for refreshing and check out after which drive to a nearby local restaurant for lunch. This afternoon, drive over a small mountain road overlooking two superb lakes: Buyan and Tamblingan. We continue to Lake Bratan where you will stop for a visit to the very scenic Ulun Danu Temple. The temple is set in the middle of the lake’s calm waters on a small bit of land giving the impression that it is ‘floating’. From here, we go to the nearby traditional local market of Bedugul where a myriad of fruits, vegetables and orchids are for sale from the area’s gardens. There are also stalls selling exotic spices and souvenirs. 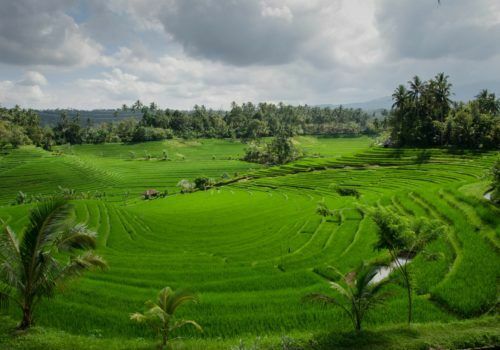 After your visit, return to the south via the UNESCO heritage listed rice fields of Jatiluwih where you will take a leisurely 1-hour walk through the terracing rice fields learning about the subak style of rice production in Bali. Continue to Umabian and check in to your hotel. Designed to resemble a traditional house, the numerous pavilions and guestrooms are laid out in the style of a village compound. Surrounded by rice fields and a swimming pool in the garden, this is an ideal place to unwind. After breakfast, start the day with an amazing sustainable tourism excursion at Taman Sari Buwana farm. During this trip you will experience local Balinese life while supporting a community-based tourism project in the village of Tunjuk. Upon reaching Tunjuk village, prepare for farming activities by donning a farmer’s hat, covering up with mosquito repellent and picking up a local mattock (small farm tool) all provided by the farm. We recommend wearing flip-flops or similar as well as bringing sunscreen. You’ll then walk with the local farmers to their rice fields, locally referred to as sawah. Alongside the farmers, you will learn how to plant, transplant or harvest rice (depending of the time of year). After farming, take a walk around the beautiful rice fields to observe the daily activities of the village. You’ll visit other plantations including a coconut plantation where locals will demonstrate their ability to climb up the trees and gather young coconuts for some refreshment. Next, return to the home base where you will observe the boiling of cassava in the traditional kitchen before enjoying a delicious lunch at the farm. This afternoon, transfer to Ubud stopping en route at the serene Taman Ayun temple near Mengwi. We also make a stop at the famous Tanah Lot temple, set on a rock in the sea and can only be reached by the local Hindu population while low tide. Continue to Ubud and check in to your hotel and have time for refreshing. No visit to Bali would be complete without witnessing traditional dance and this evening, in Ubud, you will be treated to a performance in a nearby village. Return to Ubud for dinner in a local restaurant. This morning after breakfast your driver and tour guide will pick you up for the start of your visits today. We first stop to visit Tampaksiring village where we explore Tirta Empul, a temple famous for its sacred spring water. All Balinese will bathe there at least once a year for a ritual cleaning in these holy waters dedicated to Vishnu. We drive a bit further South towards Ubud where we have lunch overlooking the beautiful rice terraces of Tegalalang. From here we drive to Ubud centre where you can enjoy the afternoon with a one-hour Balinese massage treatment at a local spa. Return to your hotel and remainder of the day is free at leisure. Spend this morning discovering the many charms of Ubud as you visit museums, palaces and local markets. Start with a visit to ARMA Museum (Agung Rai Museum of Art) and enjoy one of the best permanent collections of Balinese and Indonesian paintings. A visit to ARMA provides a great overview of the island’s rich artistic traditions. Finish this morning’s excursion with a walk in Ubud Market where local vendors come to buy and sell food as well as handicrafts and textiles. Lunch will be served at Indus Restaurant, one of Ubud’s top tables, with breathtaking views over the Tjampuhan river valley. At the end of the day, you will be transferred to your South Bali beach hotel for a chance to relax in Bali (not included) or to the airport in Denpasar for your onward flight.